Ocean Ridge is located within minutes of beautiful Sunset Beach, nestled between the historic charm of Wilmington, NC, and the excitement of Myrtle Beach, SC. 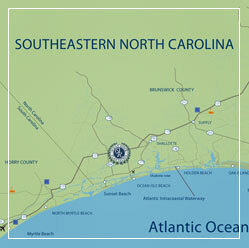 The desirable coastal lifestyle of southeastern North Carolina features small town charm and modern city luxuries. Visit Ocean Ridge in Brunswick County, North Carolina and enjoy year-round moderate temperatures (average of 73°), pristine beaches, boating, fishing, local attractions, and, most of all, the relaxation of a coastal culture. Plan your visit to the Carolina coast with our Dream Getaway, which includes three days and two nights of accommodations, dinner for two, a round of golf, and a private tour of the Ocean Ridge community. Voted the number one barrier island in North Carolina by Duke University researchers and “One of The Best Beaches in The World” by National Geographic magazine, this top destination for beachgoers is just three minutes away from the Ocean Ridge community. Driving over the 65′ arc bridge emphasizes the area’s eagerness to embrace the new, while respectfully preserving its uncrowded and relaxed way of life. The unique south-facing direction of Sunset Beach affords both subtle and significant benefits. Because the island runs from east to west, sunbathers can enjoy direct views of the ocean without having to fight the sun, the tides are much more clement than a traditional east-facing coastline, and the island is better positioned for the warming effects of the Gulf Stream. Just 45 minutes north, lies the 250-year-old port city of Wilmington. This is a beautiful “walking city” where you can stroll down lovely streets lined with 18th and 19th century homes and enjoy the meandering waters of the Cape Fear River. The city provides all of the modern day amenities one expects from urban living – and much, much more. Unlike most towns its size, Wilmington sustains a flourishing artistic community. In addition to having its own symphony orchestra, opera, and ballet company, the city is home to many active theatrical venues, art galleries, and film-making studios. There’s always something to do in Wilmington as historic tours, restaurants, and retail stores abound in the scenic downtown district. Just 25 minutes south you’ll find the excitement of Myrtle Beach’s famous “Grand Strand”, where you can enjoy a variety of musical entertainment and shows, great restaurants, boundless shopping, amusement parks, excellent medical facilities, and more than 100 golf courses. Founded in 1938 and named in honor of its abundant native wax myrtle bush, Myrtle Beach lies between the Atlantic Intracoastal Waterway on the west and the Atlantic Ocean on the east. It is considered the #1 Family Beach in America and one of the most popular destinations on the east coast of the United States. Myrtle Beach attracts visitors from around the world each year to 60 miles of popular beaches, an aquarium attraction, amusement parks, nightclubs, fine restaurants, an international airport, and the largest shopping mall in South Carolina. A thriving live theater industry includes the Alabama Theater, Dolly Parton’s Pirates Voyage, the Carolina Opry, and House of Blues. As the birthplace of a popular form of dancing called the Shag, Myrtle Beach offers a multitude of Shag clubs and yearly contests along Main Street and Ocean Boulevard. 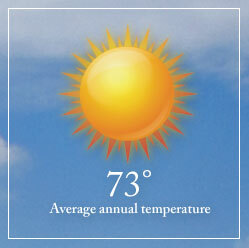 The area is also renowned for its oceanfront luxury hotels, resorts, and spas. Come and find out why National Geographic magazine just named Sunset Beach “One of the Best Beaches in the World.” Come sample the lifestyle of southeastern North Carolina and Ocean Ridge Plantation by taking advantage of our specially priced Coastal Getaway. Be our guest for three days and two nights, and enjoy coastal accommodations, a round of complimentary golf, and a personal guided tour of our incredible community. Enjoy on-site dining at the clubhouse in the Tiger's Eye Grille or Tamers Restaurant & Lounge. Nearby area restaurants are conveniently located in Shallotte, Calabash, Sunset Beach, Ocean Isle Beach, Southport and Wilmington, North Carolina and Myrtle Beach, South Carolina.